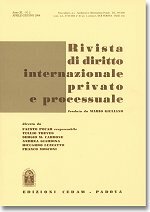 The first issue of 2014 of the Rivista di diritto internazionale privato e processuale (RDIPP, published by CEDAM) was just released. It features three articles, one comment and two reports. Alberto Malatesta, Professor at the University Cattaneo-LIUC in Castellanza, examines the interface between the new Brussels I Regulation and arbitration in “Il nuovo regolamento Bruxelles I-bis e l’arbitrato: verso un ampliamento dell’arbitration exclusion” (The New Brussels I-bis Regulation and Arbitration: Towards an Extension of the Arbitration Exclusion; in Italian). This article covers the “arbitration exclusion” as set out in the new EU Regulation No 1215/2012 of 12 December 2012 on jurisdiction and recognition and enforcement of judgments in civil and commercial matters, recasting the old “Brussels I” Regulation, No 44/2001. The new Regulation apparently retains the same solutions adopted by the latter by providing only for some clarifications in lengthy Recital No 12. However, a careful analysis shows that under the new framework the above “exclusion” is more far reaching than in the past and it impinges on some controversial and much debated issues. After reviewing the current background and the 2010 Proposal of the European Commission on this issue – rejected by the Parliament and by the Council –, this article focuses mainly on the following aspects: i) the actions or the ancillary proceedings relating to arbitration; ii) parallel proceedings before State courts and arbitration and the overcoming of the West Tankers judgment stemming from Recital No 12; iii) the circulation of the Member State courts’ decisions ruling whether or not an arbitration agreement is “null and void, inoperative or incapable of being performed”; iv) the recognition and enforcement of a Member State judgment on the merits resulting from the determination that the arbitration agreement is not effective; v) the potential conflicts between State judgments and arbitral awards. Pietro Franzina, Associate Professor at the University of Ferrara, addresses the issue of lis pendens involving a non-EU Member State in “Lis Pendens Involving a Third Country under the Brussels I-bis Regulation: An Overview” (in English). The paper provides an account of the provisions laid down in Regulation (EU) No 1215/2012 on jurisdiction and the recognition and enforcement of judgments in civil and commercial matters (Brussels I-bis) to deal with proceedings concurrently pending in a Member State and in a third country (Articles 33 and 34). It begins by discussing the reasons for addressing the issue of extra-European lis pendens and related actions within the law of the European Union. Reference is made, in this connection, to the relevance accorded to third countries’ proceedings and the judgments emanating therefrom under the Brussels Convention of 1968 and Regulation (EC) No 44/2001, as evidenced inter alia by the rule providing for the non-recognition of decisions rendered in a Member State if irreconcilable with a prior decision coming from a third country but recognized in the Member State addressed. The paper goes on to analyse the operation of the newly enacted provisions on extra-European lis pendens and related actions, in particular as regards the conditions on which proceedings in a Member State may be stayed; the conditions on which a Member State court should, or could, dismiss the claim before it, once a decision on the merits has been rendered in the third country; the relationship between the rules on extra-European and intra-European lis pendens and related actions in cases where several proceedings on the same cause of actions and between the same parties, or on related actions, have been instituted in two or more Member States and in a third country. Chiara E. Tuo, Researcher at the University of Genoa, examines the recognition of foreign adoptions in the framework of cultural diversities in “Riconoscimento degli effetti delle adozioni straniere e rispetto delle diversità culturali” (Recognition of the Effects of Foreign Adoptions and Respect for Cultural Diversity; in Italian). This paper focuses on the protection of cultural identities (or of cultural pluralism) in the context of proceedings for the recognition of the effects of adoptive relationships established abroad. The subject is dealt with in light of the case-law of the European Court of Human Rights (ECtHR) as it has recently developed with regard to Art. 8 of the Convention for the Protection of Human Rights and Fundamental Freedoms, which, as it is well known, enshrines the right to family life. According to the ECtHR’s case-law, a violation of Art. 8 of the Convention may be ascertained when personal status legally and stably constituted abroad are denied transnational continuity. Thus, on the basis of said ECtHR jurisprudence, this paper raises some questions (and tries to provide for the related answers) with regard to the consistency therewith of the conditions that familial relationships created abroad must satisfy when their recognition is sought pursuant to the relevant provisions currently applicable within the Italian legal system. Sara Tonolo, Associate Professor at the University of Trieste, “La trascrizione degli atti di nascita derivanti da maternità surrogata: ordine pubblico e interesse del minore” (The Registration of Birth Certificates Resulting from Surrogacy: Public Policy and Best Interests of the Child; in Italian). Nowadays surrogacy is a widespread practice for childless parents. Surrogacy laws vary widely from State to State. Some States require genetic parents to obtain a judicial order to have their names on the original birth certificate, without the name of the surrogate mother. Other States (e.g. Ukraine) allow putting the name of the intended parents on the birth certificate. In Italy all forms of surrogacy are forbidden, whether traditional or gestational, commercial or altruistic. Act No 40 of19 February 2004, entitled “Rules on medically-assisted reproduction”, introduces a prohibition against employing gametes from donors, and specifically incriminates not only intermediary agencies and clinics practicing surrogacy, but also the intended parents and the surrogate mother. Other penal consequences are provided by the Criminal Code for the registration of a birth certificate where parents are the intended ones, as provided by the lex loci actus (Art. 567 of the Italian Criminal Code, concerning the false representation or concealment of status). In the cases decided by the Italian Criminal Courts of First Instance (Milan and Trieste), the judges excluded the criminal responsibility of the intended parents applying for the registration of foreign birth certificates which were not exactly genuine (due to the absence of genetic ties for the intended mothers), affirming in some way that subverting the effectiveness of the Italian prohibition of surrogacy may be justified by the best interests of the child. Apart from the mentioned criminal problems, several aspects of private international law are involved in the legal reasoning of the courts in these cases: among these, probably, the one that the principle of the child’s best interests should have been read not like an exception to the public policy clause but like a basic value of this clause, in light, among others, of the case law of the European Court of Human Rights. The European Court of Human Rights (ECHR) has just rendered a decision condemning France for refusing the registration of foreign birth certificate of twins who were given birth by a surrogate mother. French courts traditionally consider the prohibition of surrogacy motherhood as a matter of public order. But things seem to change from now on.